I spent the last hour on the train trying to figure how to clean my cow-crap covered hiking boots before I got on the plane. I contemplated washing them out in the sink at the airport or hiding them in a duty-free bag and walking onto the airplane barefoot. In the end, I kept them on, shuffled quickly by the airline attendant, took my seat and made sniffy faces at the people around me, acknowledging that something terrible was in our midst (and it wasn’t me). My boots and aching knees were a happy reminder of our weekend in Wengen. Wengen is filled with happy memories for us…hiking with the kids in the summer, watching the bat-suited maniacs fling themselves off the cliffs into the Lauterbrunnen Valley, sitting on our little porch overlooking the Jungfrau as it played “now you see it, now you don’t” from behind the clouds. Wengen is easy to love. The village is car-free and accessible only by cog-railway (or by foot from the valley). No cars, no horns, no crowds…just the sound of wind, waterfalls and cowbells to lull you to sleep at night. In winter, Wengen is a skiers’ paradise. In summer, the mountains and gondolas belong to the hikers and outdoor enthusiasts. Taking the train to Wengen from Zurich requires 3 changes, 4 if you do it incorrectly like we did. It’s a fabulous way to arrive in the village, a slow transition for the senses. City gives way to farmland, farmland stretches out along green-blue lakes, little wooden chalets dot the hills that lead to the final train up into the mountains. The last train from Lauterbrunnen winds through alpine forests and along mountain streams to Wengen. We booked a room at Hotel Baeren this time, just below the train station. It’s a lovely, family-run hotel with excellent food (my daughter can recite her dinner order from 5 years ago) and a very reasonable half-board rate. Despite our late arrival, the hotel saved us a lovely corner table for dinner overlooking the Lauterbrunnen Valley and a balcony room (and a soaking tub) with spectacular mountain views. We lingered as much as we could over dinner, admiring the view and creating plans, big plans for hiking the next day. My plan for a hike turned into a 5 hour death march in the rain/freezing rain/light snow. Note: Polartecs are not waterproof, gore-tex boots do not prevent mud and cow-crap suckage through your lace holes and you should consider carrying laminated maps on rainy days in Switzerland. Wengen is the most beautiful village in the Jungfrau Region of the Bernese Oberland. 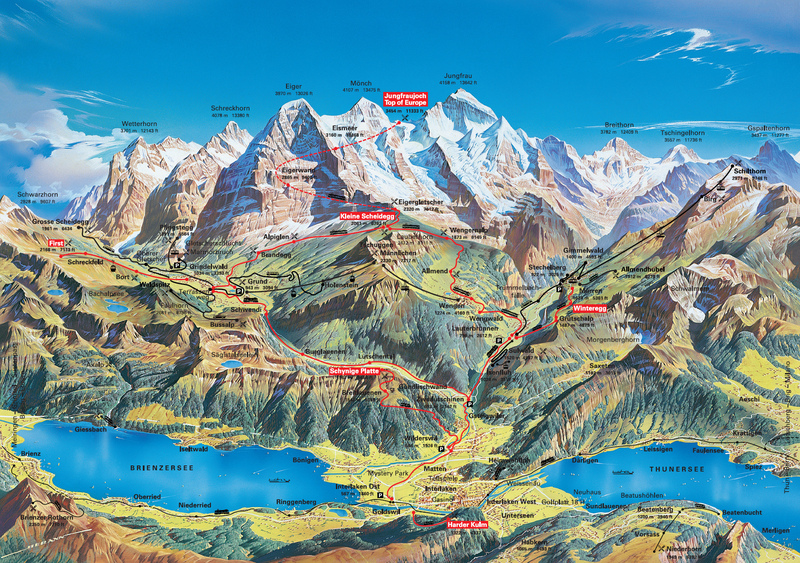 It is well situated for visitors to the Jungfrau and Lauterbrunnen area. The excellent system of train, gondola and lift can get hikers and non-hikers anywhere in the valley. Check the map. Travel on the Swiss Rail system can be expensive and it’s wise to investigate the various discount options before you go. For visitors that make multiple trips to Switzerland should consider purchasing a half-fare card. If you are visiting for a short vacation and plan on using the trains, boats and gondolas extensively, consider the Swiss Pass which allows unlimited use on all modes of transportation including the classic scenic rail trains (a small seat reservation charge supplementary) and a 50% discount on the very expensive high -mountain excursions (Jungfrau). Children (up to 15 yrs) accompanied by parents will travel free if you ask for the complementary Family Card. For a detailed and mind-boggling explanation, read Katja’s detailed analysis. Wengen has a number of hotel and chalet options. If we are traveling as a couple or small family, we choose Hotel Baren, It’s casual, warm, friendly and comfortable. The food is excellent and it is well suited for couples or families. We had the Lobhorn room on the top floor. The soaking tub and view is your reward for carrying your suitcase up 4 flights of stairs. The hotel also has family rooms and a playroom in the basement for rainy days. I didn’t see any children in the dining room, but I’m sure the hotel will be happy to accommodate. If you are traveling as a group, consider renting a chalet.